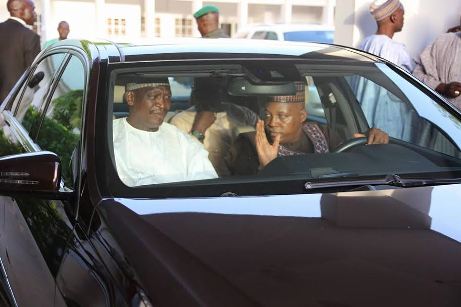 Borno State Governor, Kashim Shettima said he abandoned the use of bullet proof cars as an act of sympathy with the suffering masses who had no means of self protection from terrorists. Shettima stated this on Sunday in an interview with newsmen in Maiduguri. He said that the action was also aimed at showing that terrorists have no super natural powers. "We have to dare the terrorists; I have bullet proof cars, but I do not use them; I want to be exposed to the elements as the ordinary people do," Shettima said. He said the bullet proof cars were only kept for the use of visitors who might be afraid to use ordinary cars. "We have so many bullet proof cars but we only use them for our guests. Sometimes I drive myself round the town to see things for myself," Shettima said. The governor also attributed his numerous achievement in office to dedication and hard work. "There is no magic in our achievements, except that where there is will, there is the way; like I always say, there is no politics better than the contentment of the people. `You are there not because you are the best among the people of the state; I am the governor not because of my political sagacity, intellectual prowess, parental back ground or physical strength, " he said. "This is because even within my cabinet, there are many people who supersede me in all these attributes. Power to me is a very humble experience; it is about what you can do to a great number of people within the time allotted to you to pilot the affairs of the state." He said that with the gradual return of peace in the state, government would unfold a developmental agenda in a few months time. "By the grace of God, we are poised for a great change. “Believe me, in the next couple of months, you will see changes in the fortunes of the people of the state," Stettima said. He said that the recent successes recorded by the military against the Boko Haram terrorists, had made the state capital a safe haven for all Nigerians. ''Maiduguri is more secured than even Lagos or Abuja. "There are 2 million people living in Maiduguri; we celebrated Sallah without any incident," Shettima said. He said that the government would take advantage of the Boko Haram crisis to ensure better welfare for the people. "This crisis has accorded us the opportunity to merge small settlements and provide better infrastructure to uplift the living standard of the people. "This is more especially for those living in remote communities," Shettima said.